Home Custom Header Element Add a Custom Header Element in your Blogger ? Add a Custom Header Element in your Blogger ? 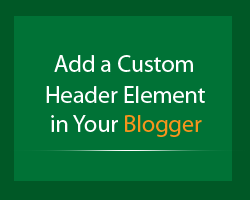 Today I show you how to add a custom header element to your blogger blog. Blogger is now offering you a custom changes static blog header including your blog title and description of your blogger blog. And you can display an image or logo with your blogger main header. So do you think you could have done more to your main header if you can use a custom header instead of default one? If you do not prefer the default header style, then you will seek around a way to customize change or add a custom header for your blogger blog. Change your custom element are so easy you just do current blog header is cannot move a bit or remove it. The blogger made the header element locked by itself and do not to remove from any users. So they have to use the default header with your blog title, and description with eligible header image. So Let's start. Your default header has been removed successfully. You can see Add a any Gadget link at the place where default header was placed before. 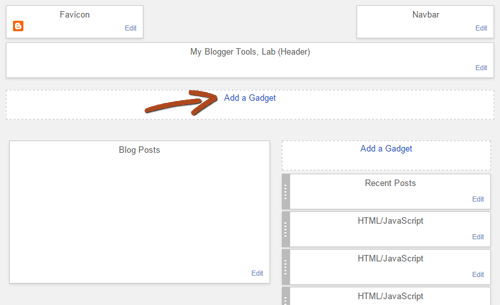 Just Click on the link to implement custom header on your blogger blog.